ABC has announced that its new sitcom “Fresh Off the Boat” will premiere on Wednesday, Feb. 4 at 8:30 and 9:30 p.m. before moving to its regular time slot on Tuesday, Feb. 10, at 8 p.m. (7 p.m. Central). Loosely based on the memoir of the same title by chef and food personality Eddie Huang, the series is set in the 1990s and center around 12-year-old, hip-hop-loving Eddie (played by Hudson Yang), who has just moved to suburban Orlando from D.C.’s Chinatown with his parents. It’s culture shock for his immigrant family in this comedy about pursuing the American Dream. This is the first Asian American sitcom on network TV since Margaret Cho’s “All-American Girl,” also on ABC, 20 years ago. Eddie, who often feels like the black sheep of his family, is not thrilled about his family’s move and wants desperately to belong. During his first day of school, he is made fun of because of his smelly Chinese food lunch. Eddie’s dad, Louis, is played by Randall Park, known for his recurring role on HBO’s “Veep” and, most recently, for playing Kim Jong Un in “The Interview.” Louis, who loves everything about America, has brought his family to Florida to open a restaurant called Cattleman’s Ranch Steakhouse. Eddie’s mom, Jessica, is played by Constance Wu, who has appeared in several Sundance feature films, including “Stephanie Daley,” “Year of the Fish,” and “The Sound of My Voice.” Jessica is a strong, protective mother who is always hard on Eddie, and a frugal, business-minded woman who doesn’t believe in wasting anything. Eddie’s brother Emery is played by Forrest Wheeler, whose credits include the movie “The Incredible Burt Wonderstone” and the TV shows “Community,” “New Girl,” and “Chasing Life.” Emery adapts very well after the family’s move, becoming the cool, popular kid instantly. He gets a girlfriend on the first day of school and easily gets dates to neighborhood events. For clips and cast bios, visit http://abc.go.com/shows/fresh-off-the-boat. Is there no one else but myself to find this sitcom slightly offensive? Especially because it replaces another show “Selfie” that portrays an Asian male as an attractive lead while this sitcom plays into the Asian stereotypes that we all hate. 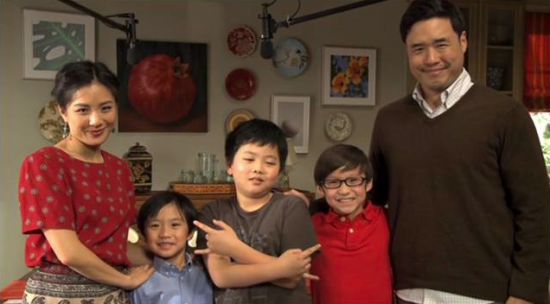 It just feels like an Asian show made for white people.